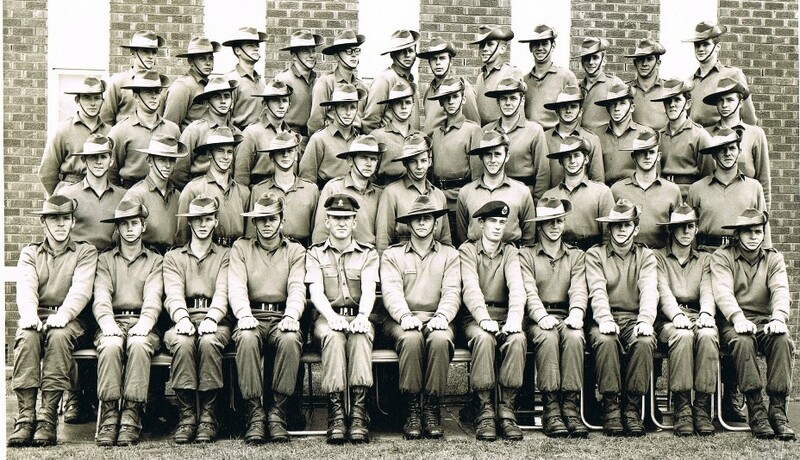 2 RTB C Coy 13 Platoon 1st Intake 1969. 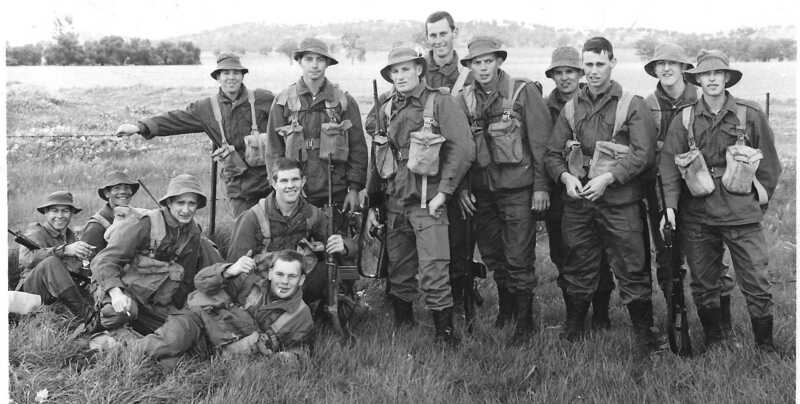 Schroeder, Mathieson, McLeod, Cooper, Kenter, Weshead, Nisbett, Turner, Kilday. 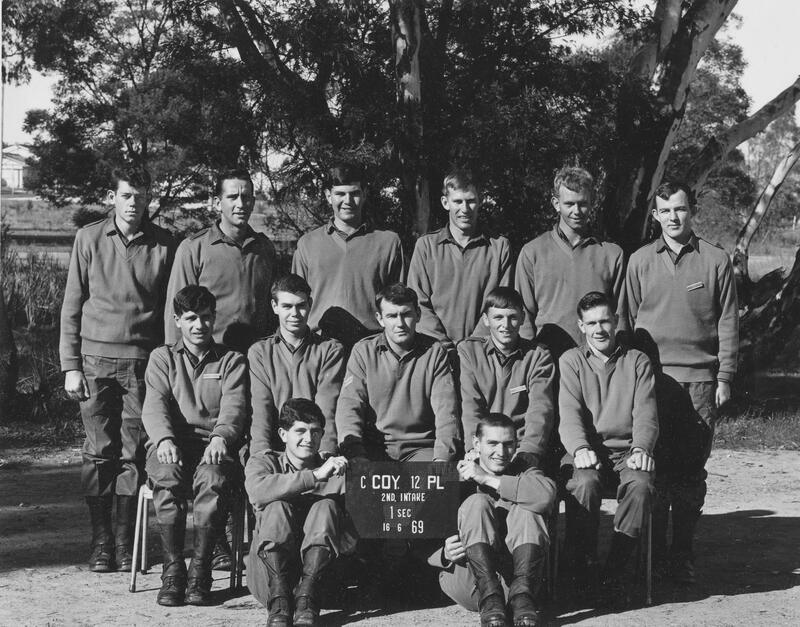 Gaffa, Palmer, Chaberka, Dowson, Despott, Agnew, Kenny, Bogan, Giesler. 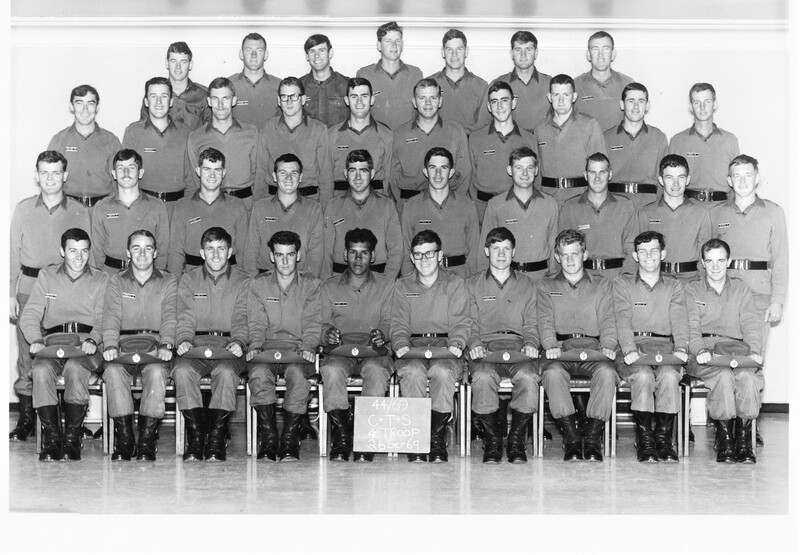 Sent in ~ Jens Schroeder. 2 RTB C Coy 13 Platoon 17 1st Intake 1969. 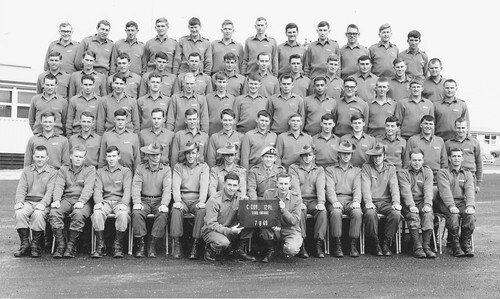 2 RTB D Coy 16 Pl 3rd Intake 2 Sect 1969. 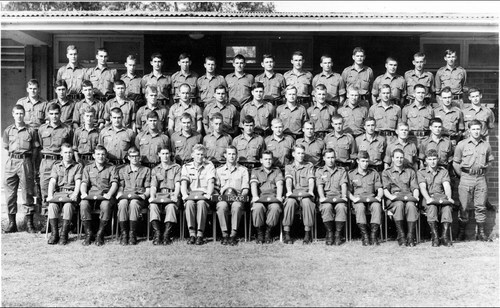 2 RTB D Coy 16 Pl 3rd Intake 1969. 2nd row from front 8th from the left.Ron Davies. 3TB D Coy 16 Pl Singleton 1969. 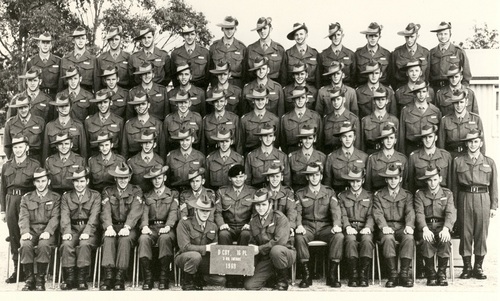 2 RTB D Coy 18 Pl 3rd Intake 1969. 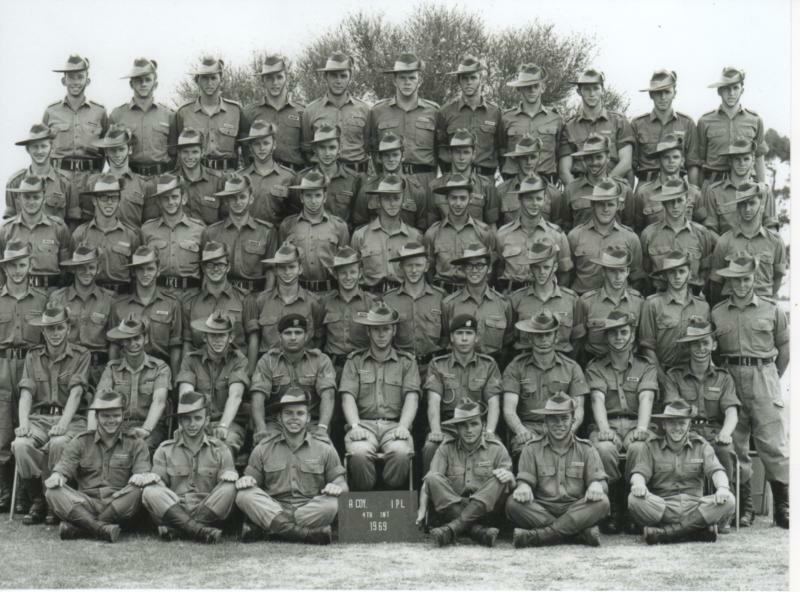 2 RTB D Coy 18 Platoon 1st Intake 1969. 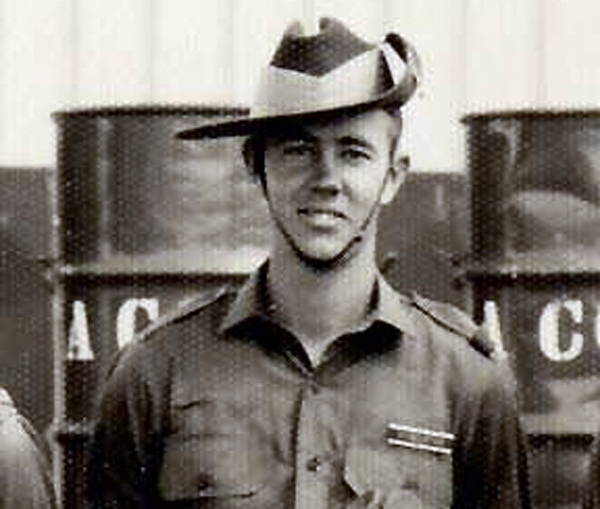 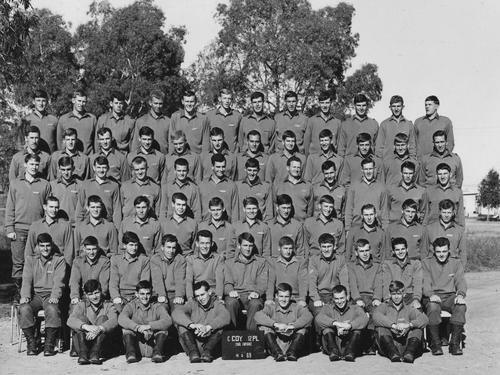 1 RTB 15 Pl C Coy Kapooka June 1969. 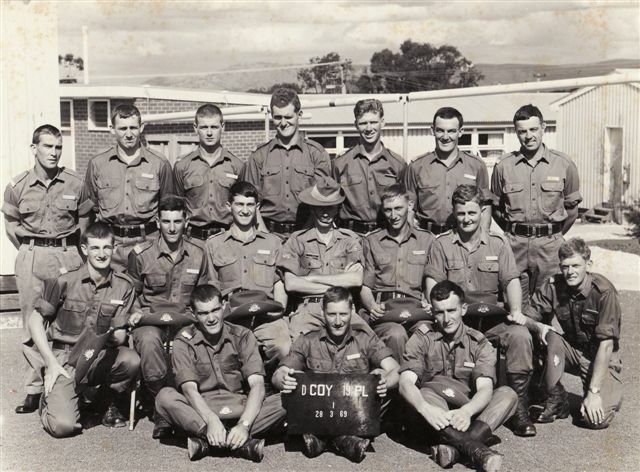 Sent in ~ John Willett. 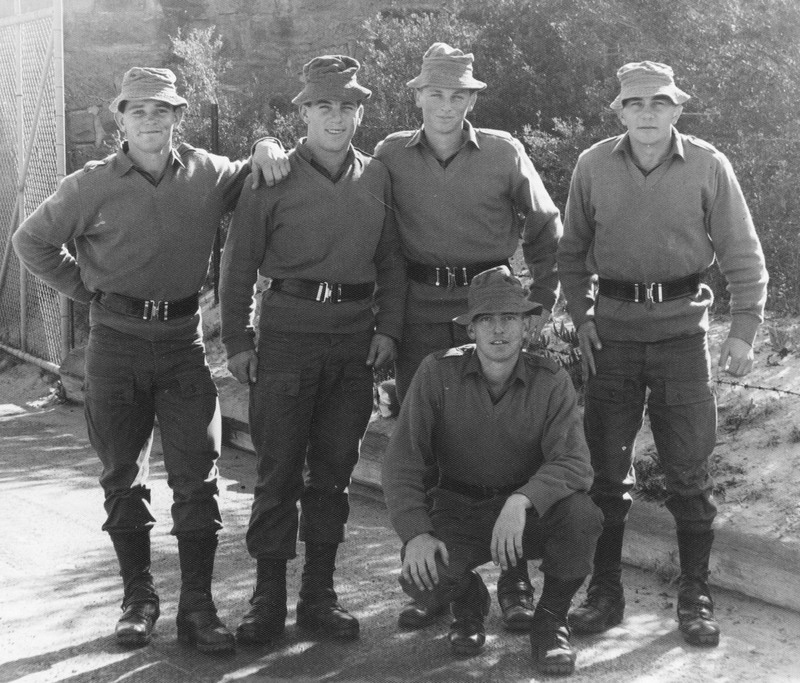 RAE 3 Troop 43-69 SME 11 July 1969. 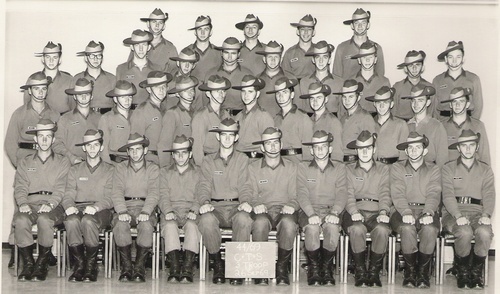 44/69 CTS 1 Troop 1969. 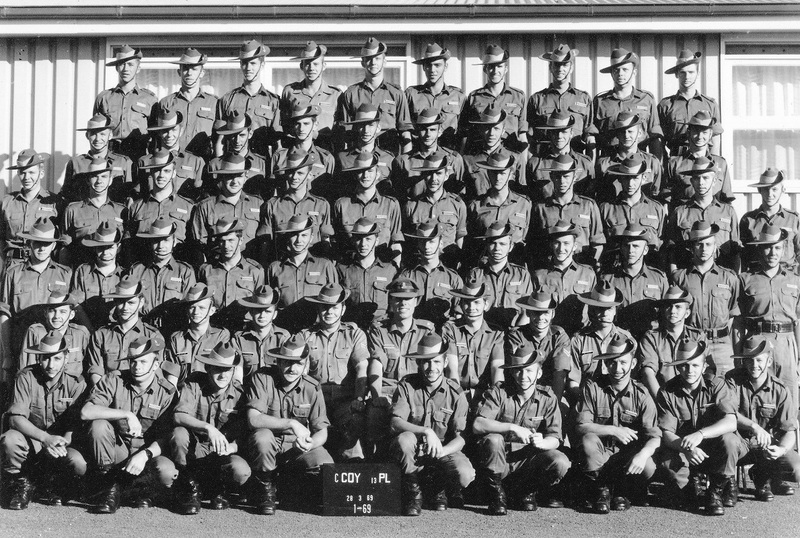 2 RTB C Coy 12Pl 3 Intake 1969. 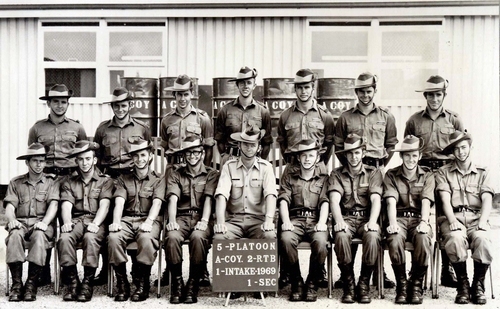 2 RTB C Coy 12PL 3rd Intake 4 Sect 1969. 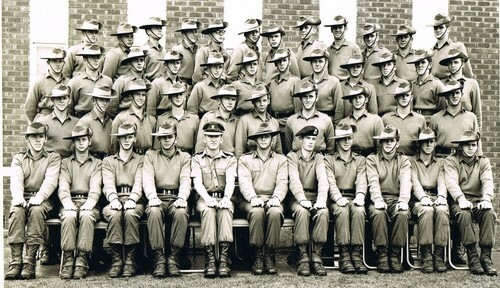 2 RTB C Coy 11 Platoon 3rd Intake 1969. 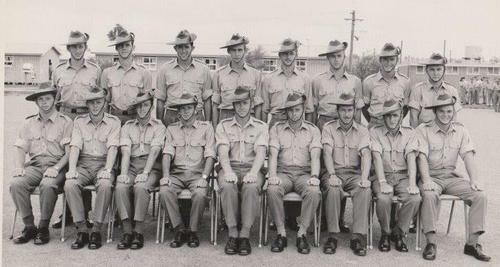 3rd row from front/3rd in from left,Geoff Perston. 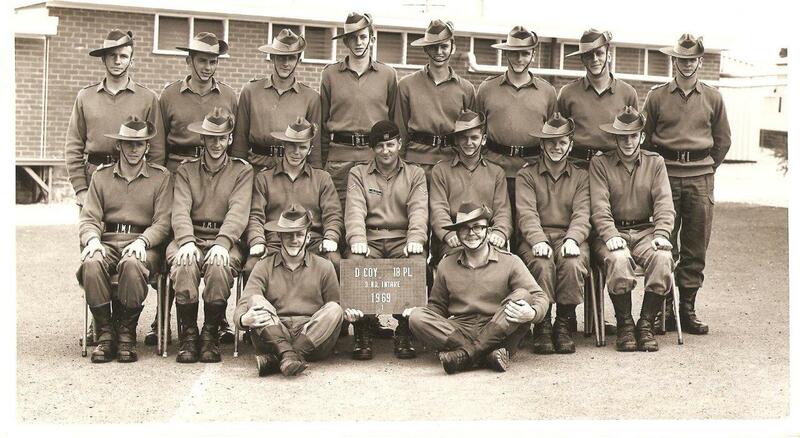 2 RTB C Coy 11 Platoon 2 Sect 3rd Intake 1969.
back row/2nd in from left,Geoff Perston. middle row/2nd in from right,Geoff Perston. 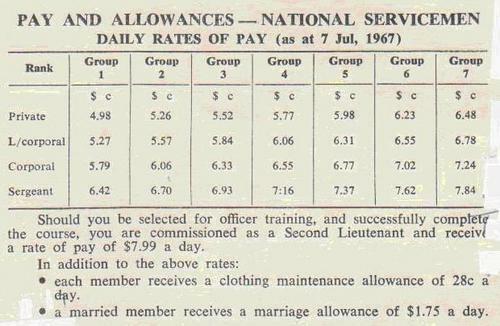 16/70 Clerk Tech 16 April 1970. 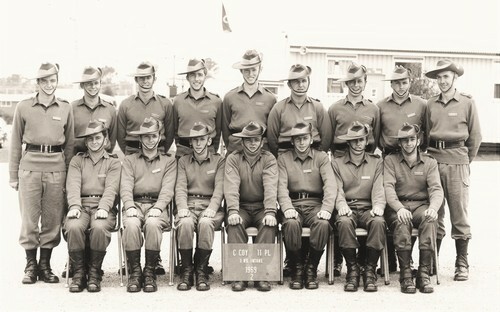 2nd row from front Geoff Perston. RAE corps training at SME in Casula NSW. 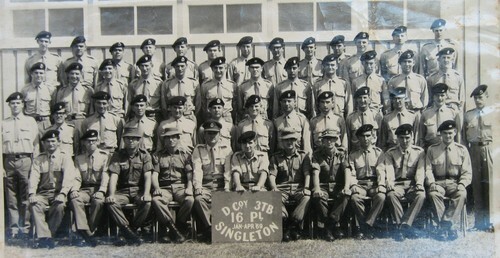 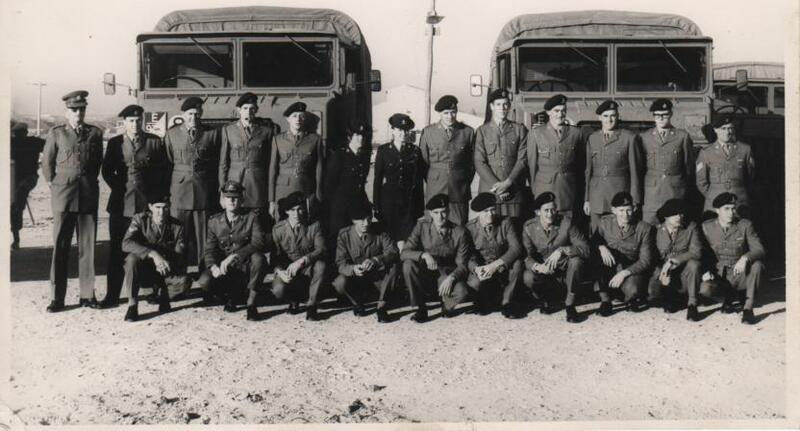 It is a photo of my platoon: 9 Pl B Coy from the first intake of 1969 at Singleton. I am the second from the right in the back row. 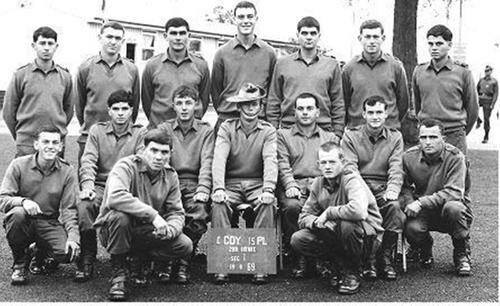 The chap on my right is Tony Holliday. 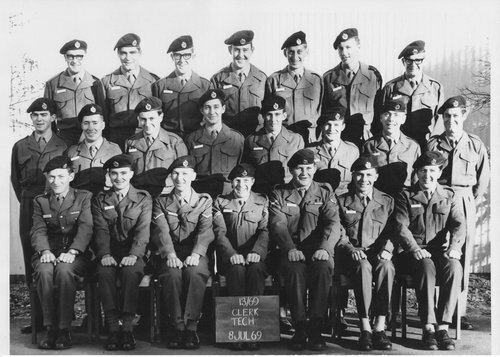 Some names of others in the photo are: Doug Ferguson (third from left in back row) Warren Fitzgerald (fourth from left in second row), Bruce Houssier (second in from left in second row), Gordon Halls, Clive Guthrie, Paul Tame, Geoff Irvine, John Faddy, Tom Foulkes, Bill Flynn, Roger Guest, Wayne Hackett, Dennis Joiner, Ken Grose, Robert Francis. 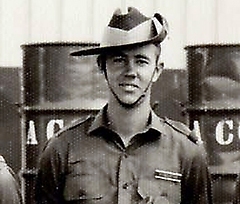 Sent In Bruce Hancock. 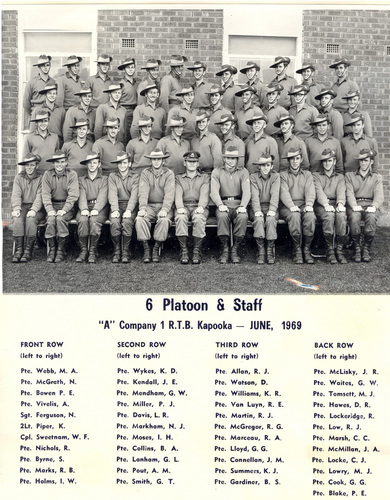 moc.kooltuo|64dnegelhlb#moc.kooltuo|64dnegelhlb. 2 RTB B Coy 8 Pl 1969 Sent in ~ Terry Scanlan. 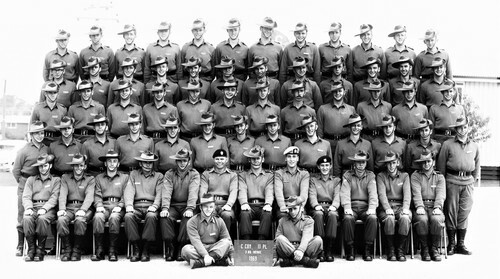 2 RTB D Coy 19 Pl Sep 1968 March out. 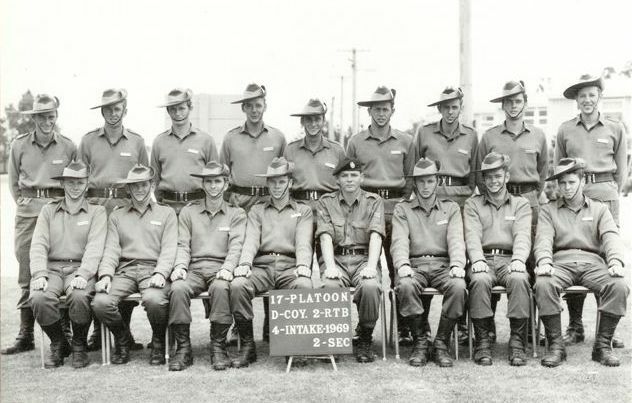 Platoon commander Terry Wesley-Smith, and Bdr Burns as the right marker. 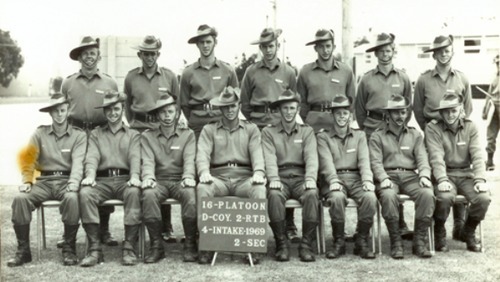 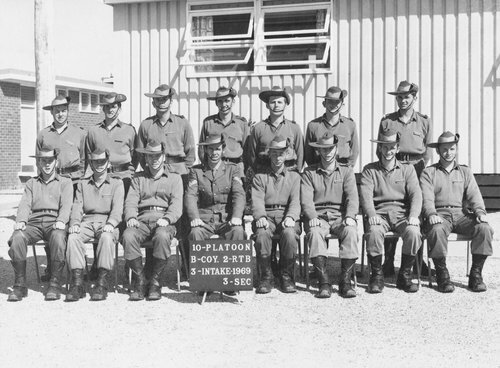 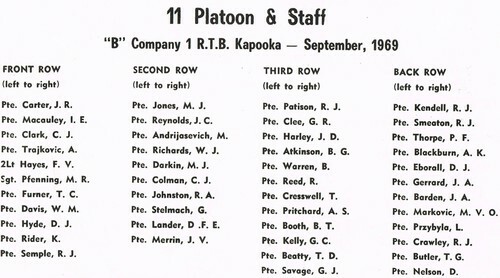 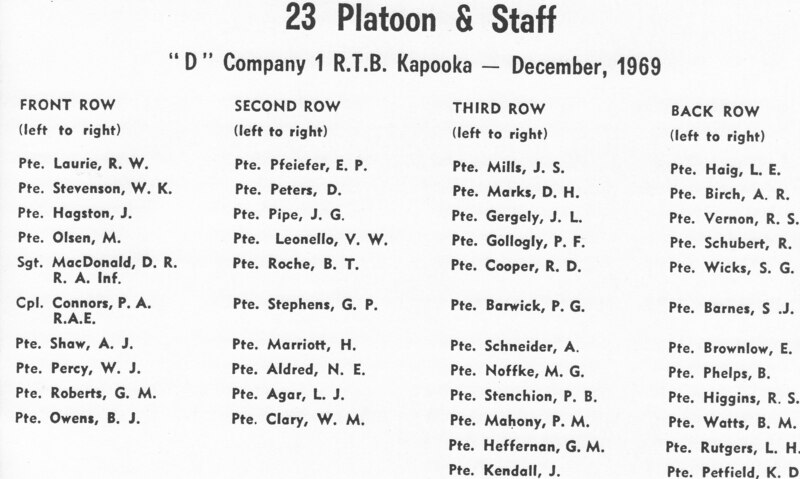 1 RTB B Coy 11 Pl Kapooka Sept 1968. 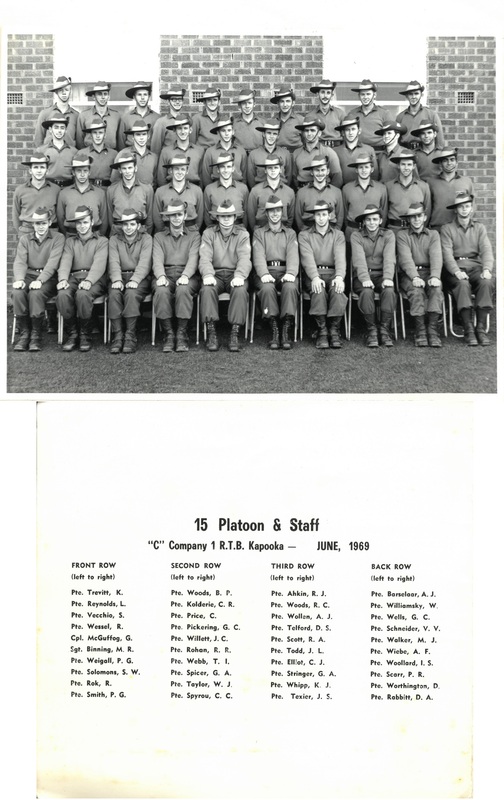 Sent In ~Jane Holmes is the Sister of ~Pte. 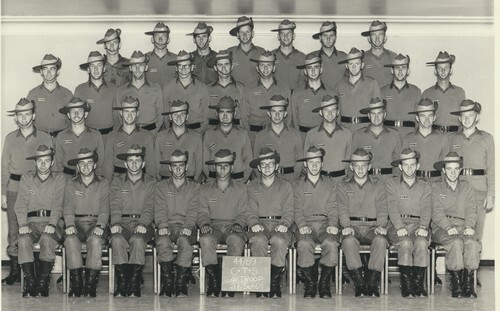 Kendell R.J. Army No:1735705. 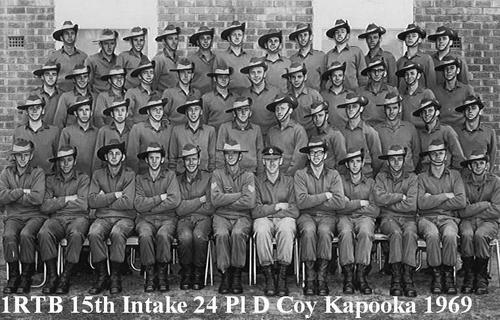 2 RTB D Coy 16 PL 4th Intake 2 Sect 1969 Pucka. Sent IN ~ Nina Craske. 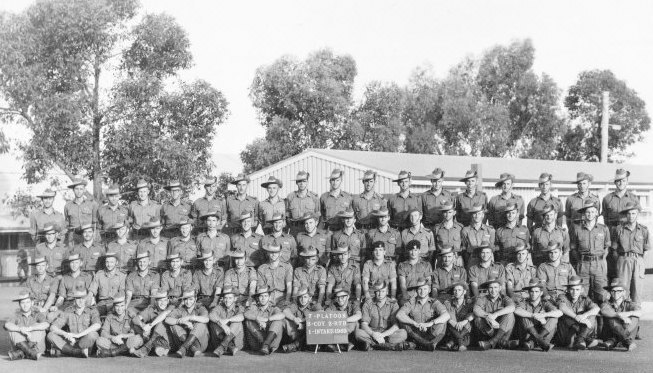 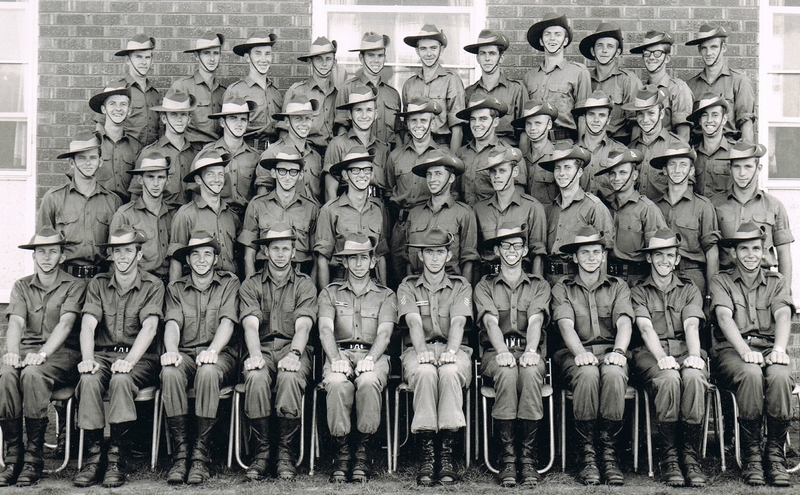 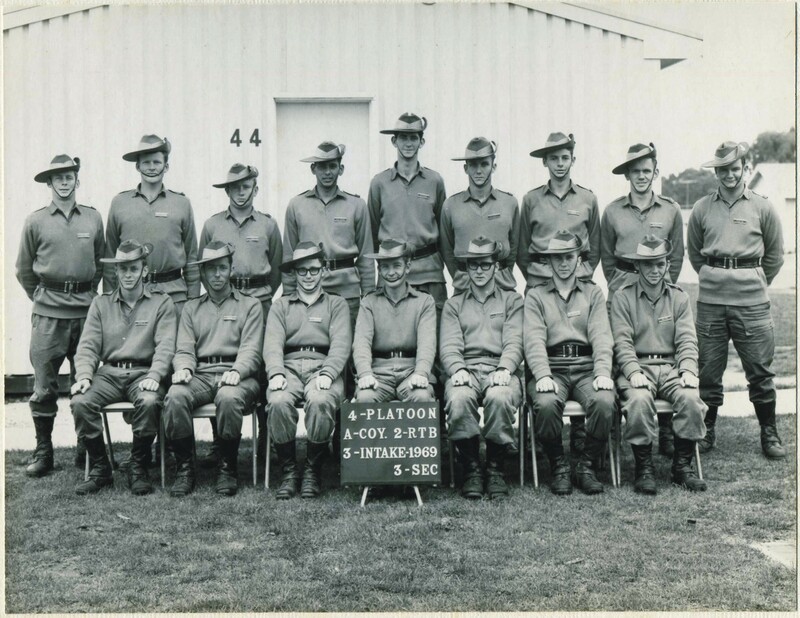 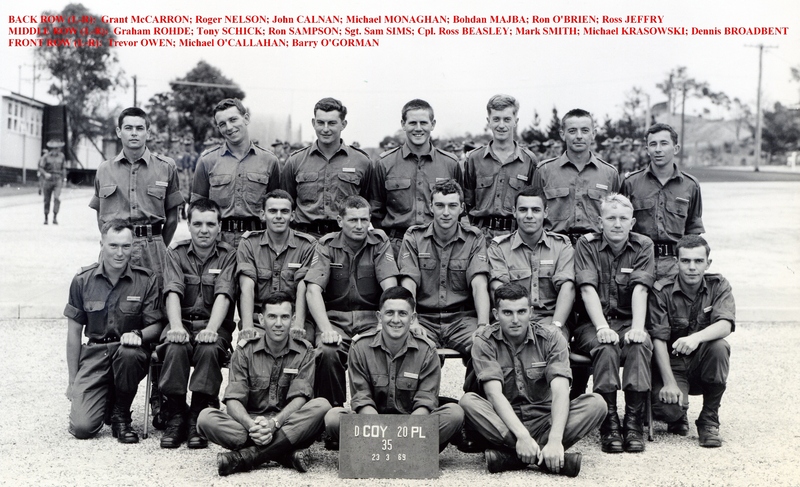 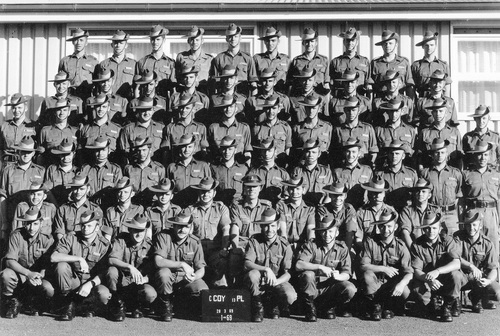 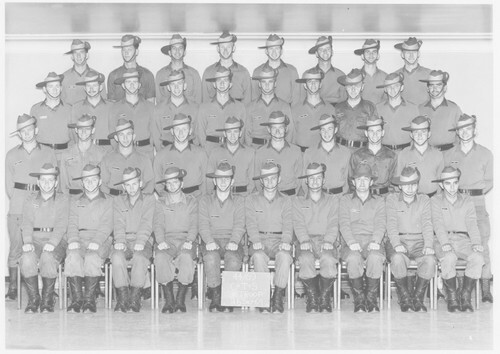 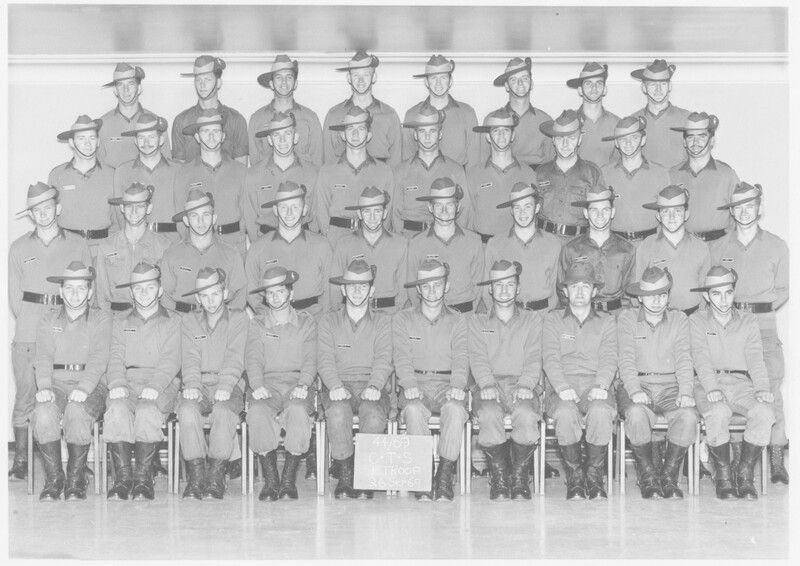 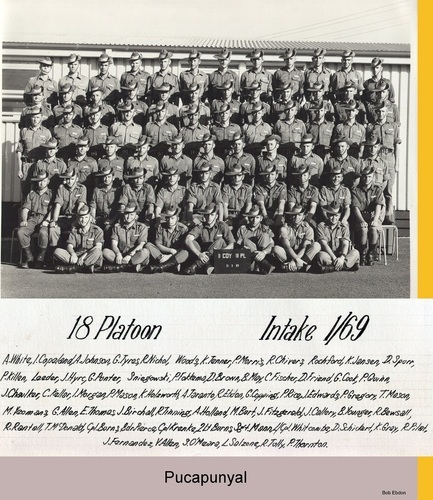 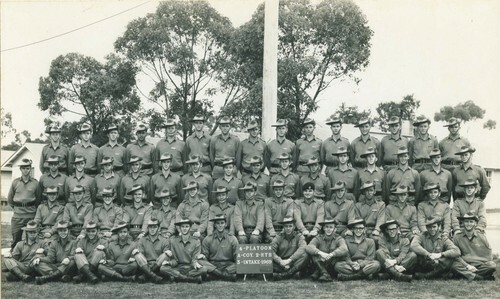 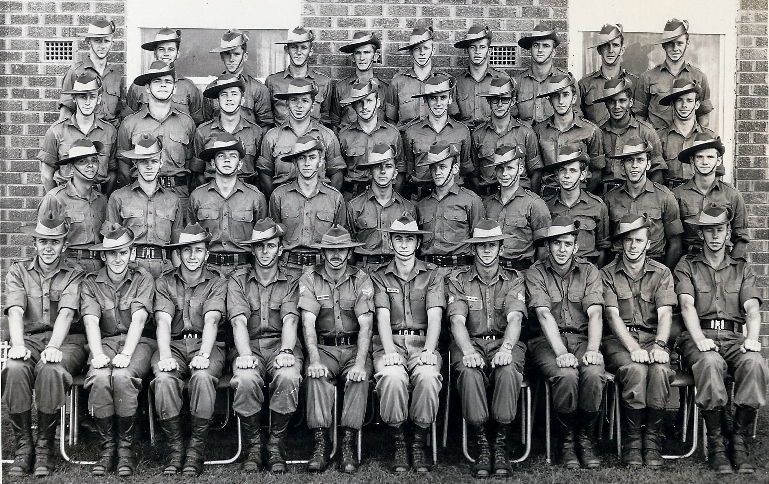 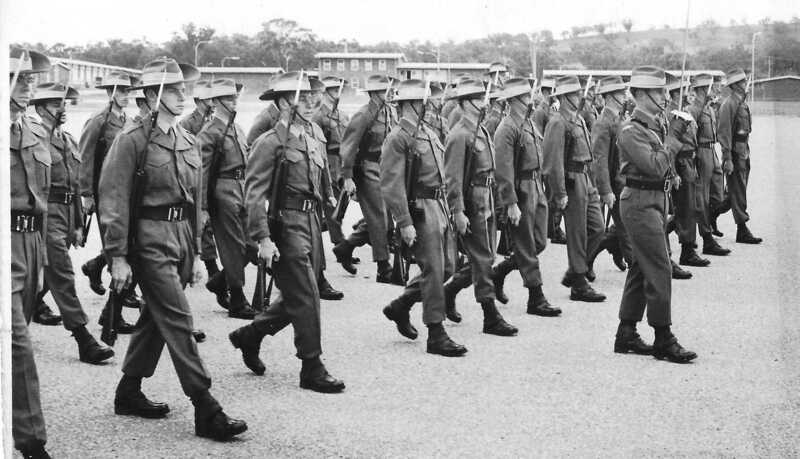 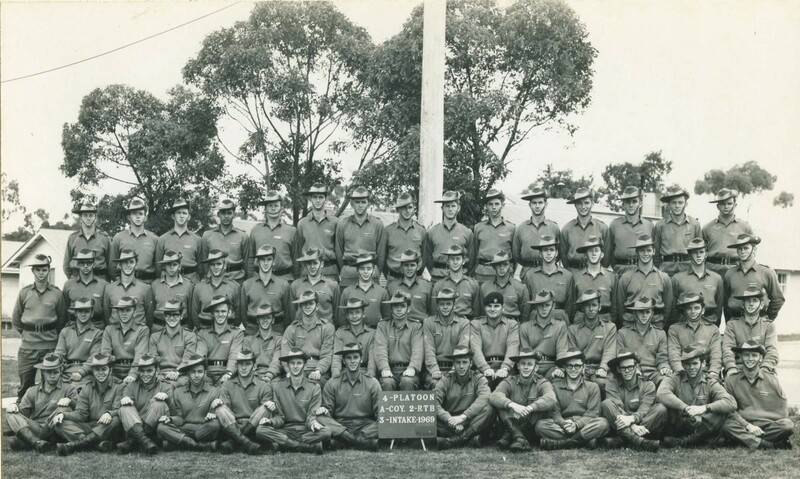 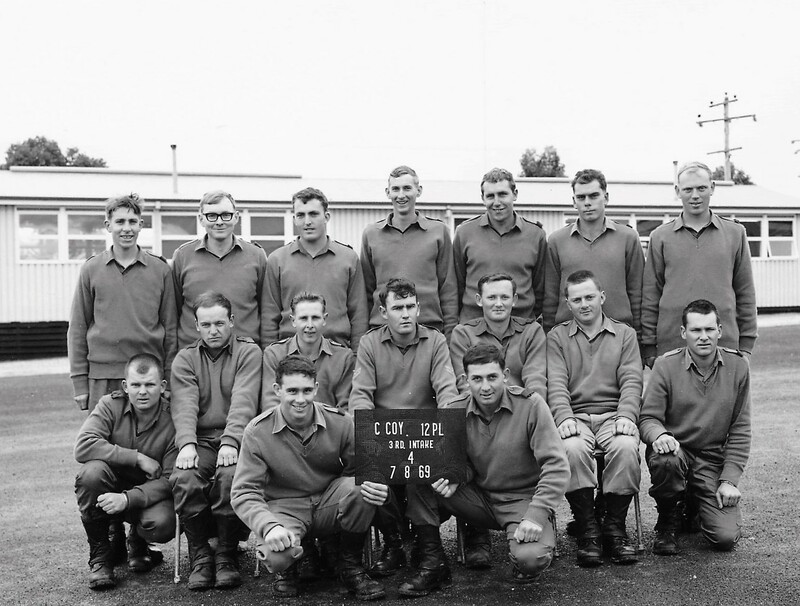 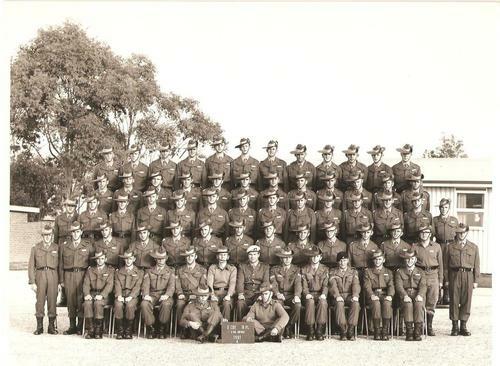 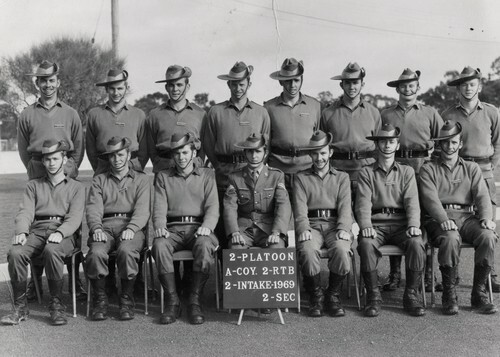 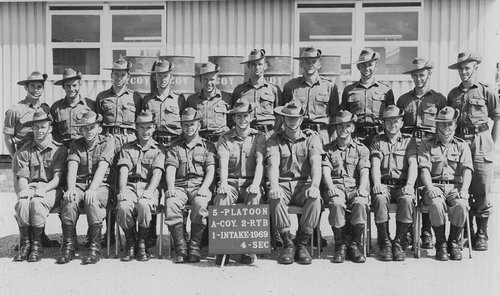 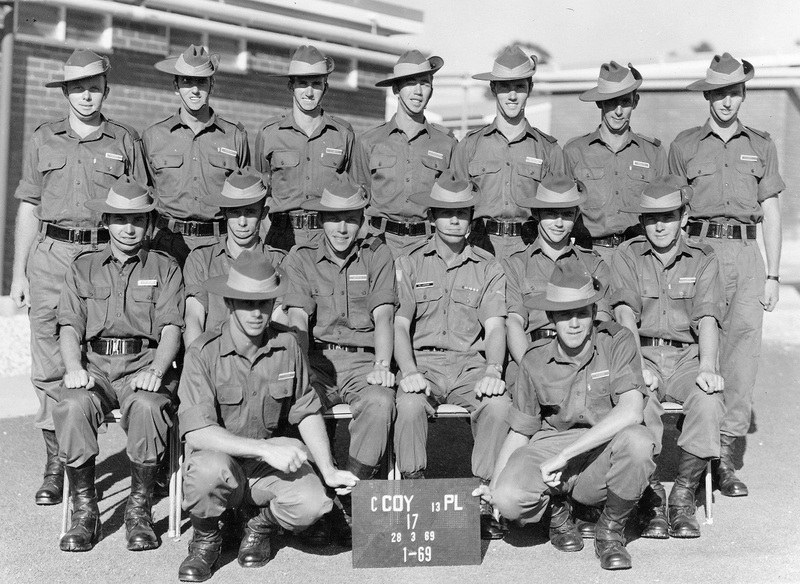 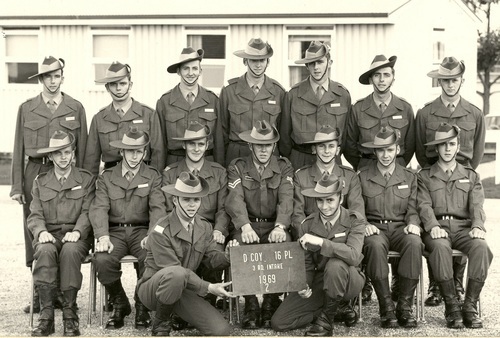 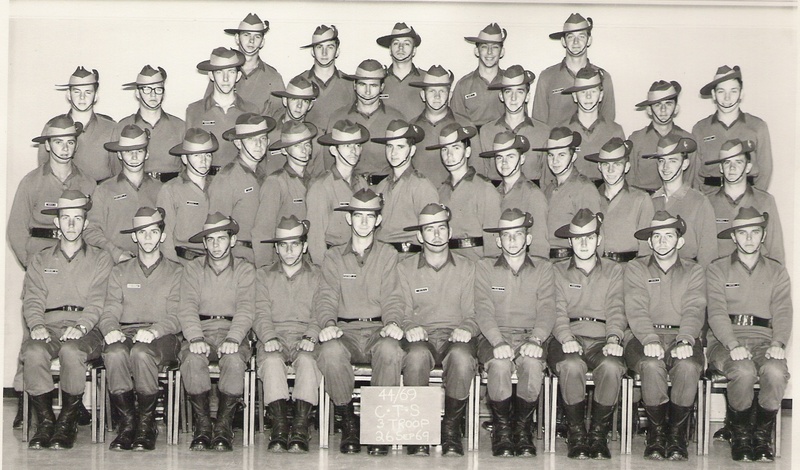 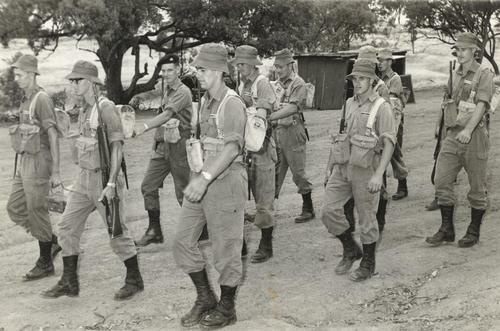 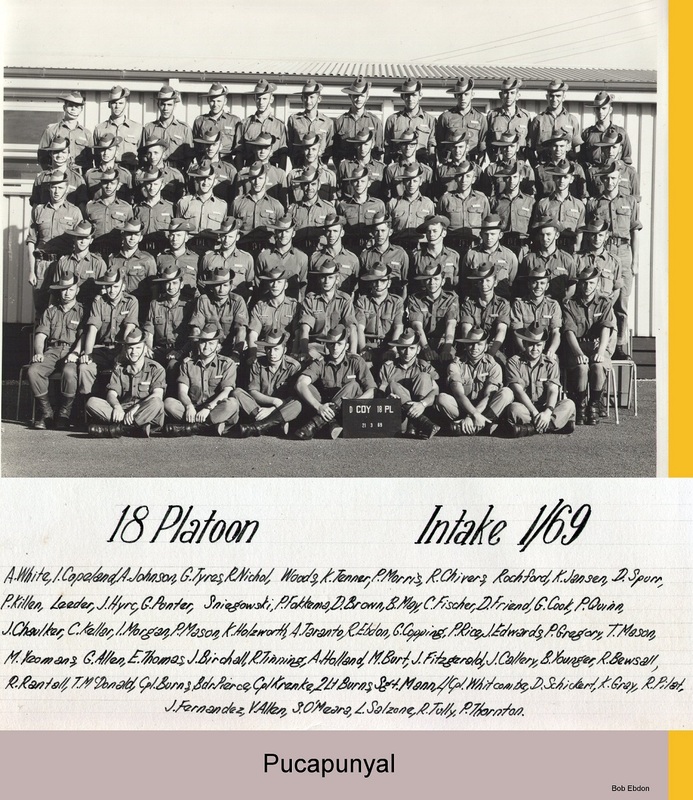 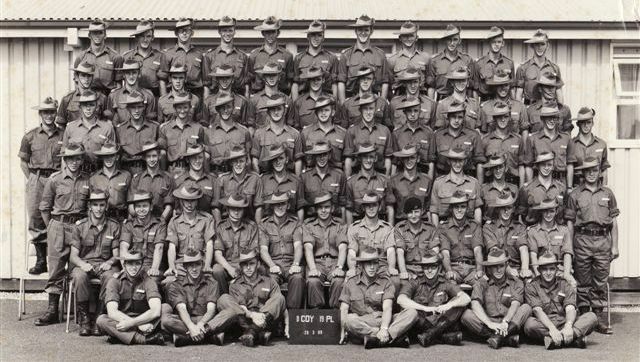 1RTB C Coy 14 Platoon Kapooka April 1969. 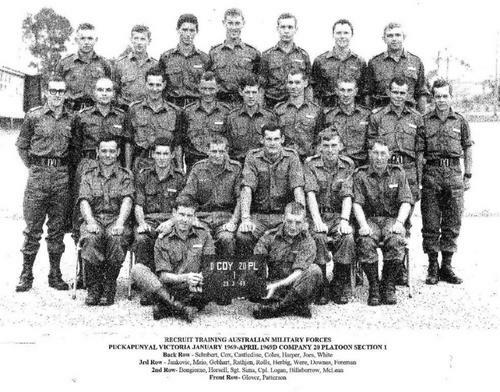 2 RTB C Coy 15 Platoon 1 Sect 1969Pucka. 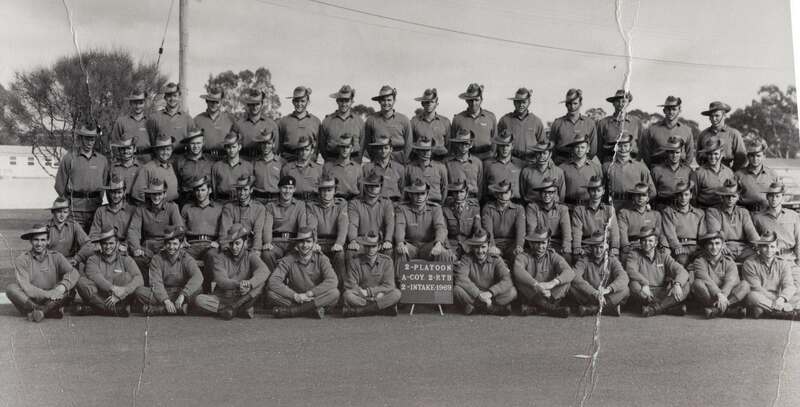 2 RTB A Coy 4th Intake 1 Platoon 1969 Pucka. Drivers Course July 1970 Randwick NSW. Transport section 5 signal reg dundas nsw. 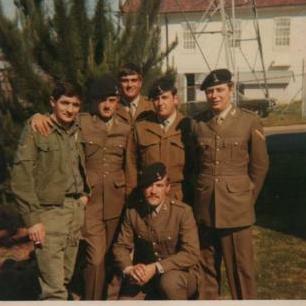 sig reid sig lambert l L/ cpl dudley L/ cpl metcalf. 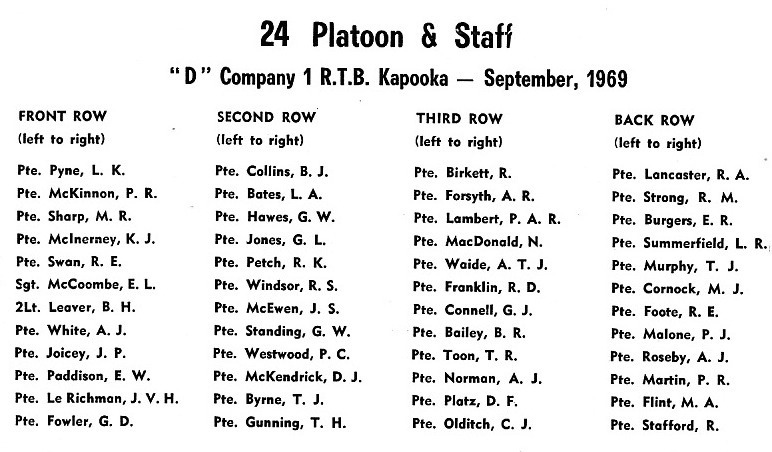 2RTB 5 Platoon. A Company. 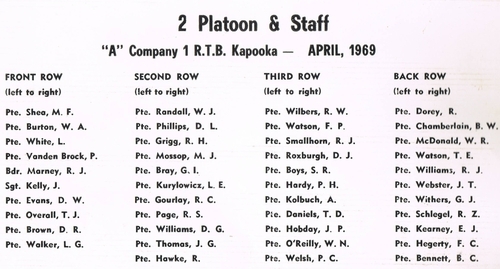 4 Section. 1 Intake 1969. SME Casula 44/69 Corps Training Course 5 Troop 1969. 2 RTB B Coy 10 Platoon 3 Intake Pucka 1969. 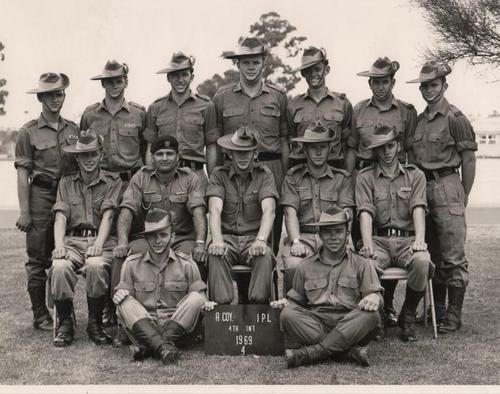 2 RTB B Coy 10 Platoon 3 Sect 3 Intake Pucka 1969. 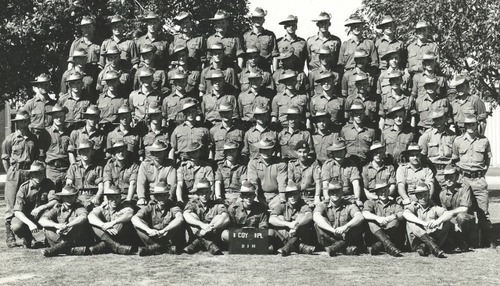 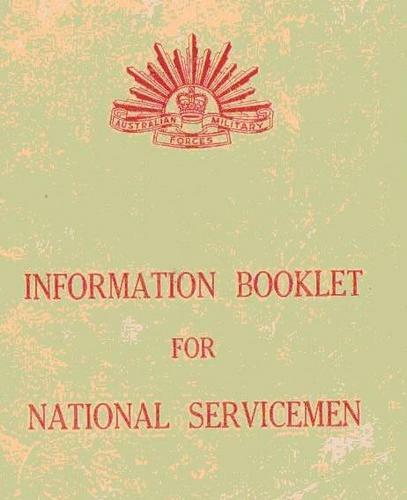 Rae 44/69 CTS 3 Troop Sept 1969. 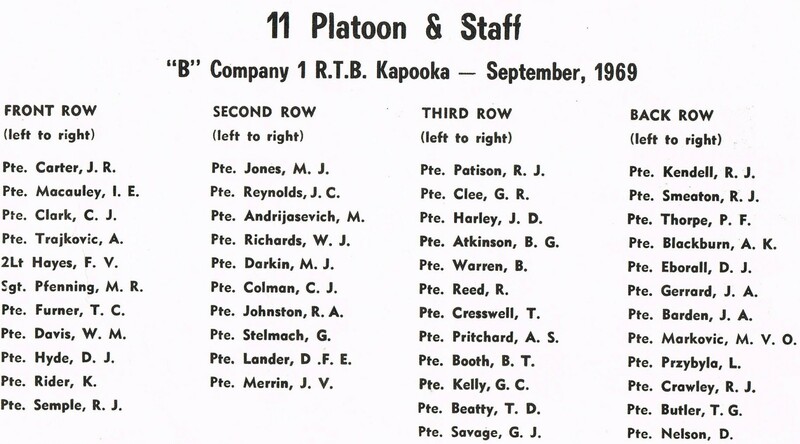 1 RTB 23 Pl D Coy Dec 1969 Kapooka 1969. 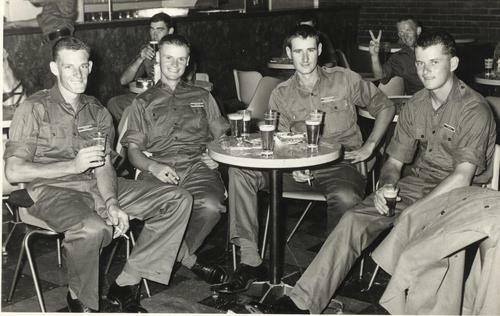 L TO R~P .Roche .S Wicks .J HAGSTON. 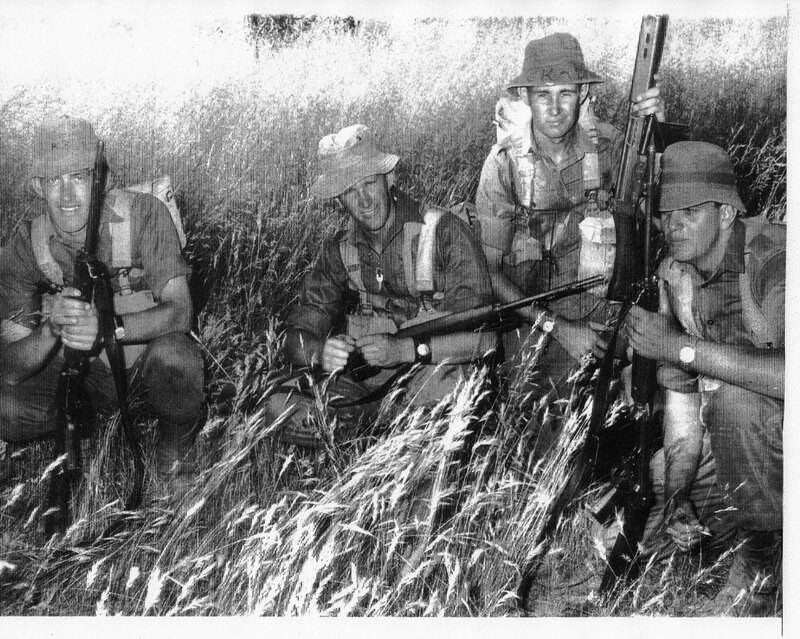 L TO R~ Squating A Birch.G Roberts.S.Swicks.J.Petfield. 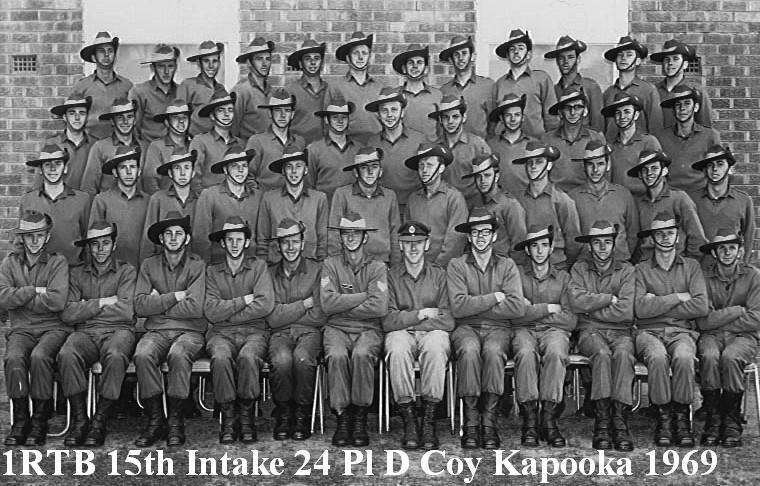 2 RTB 3 Intake 4 Pl A Coy 1969 Pucka. B Row L TO R~3rd Clem Edwards. 2 RTB A Coy 3 Sect 1969 Pucka. 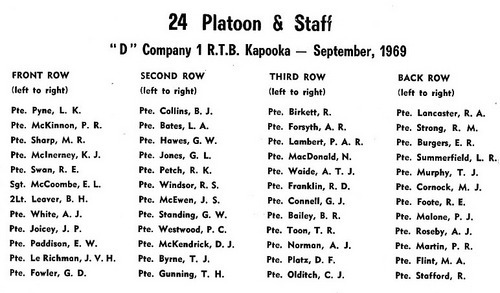 2 RTB 4 Intake 17 Platoon D Coy 2 Sect 1969 Pucka. 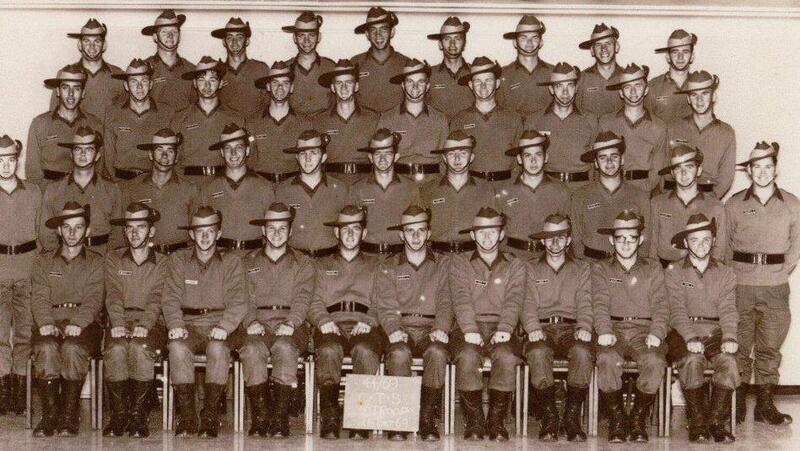 I have no idea what numbered intake it was, but recruit training for me began in April 1969. 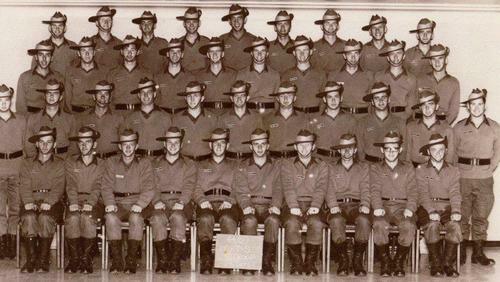 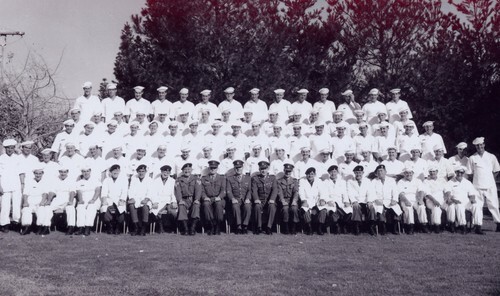 As the photo indicates, the photo was taken just prior to our re-assignment to Corps Training in June 1969. From my recollection, most of the guys here were posted to Infantry units, with the increased prospect of being Vietnam-bound. 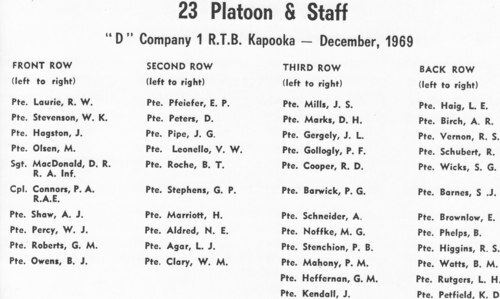 Paradoxically, of the platoon of “Regs” who occupied the floor above the 6 Platoon lines, very few were posted to a RAR and those that were, volunteered. 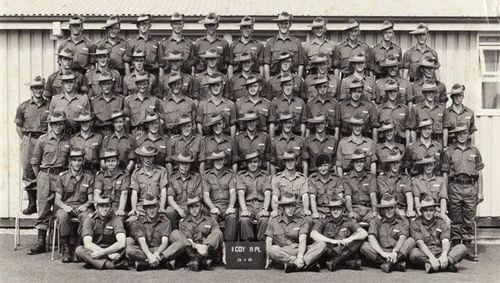 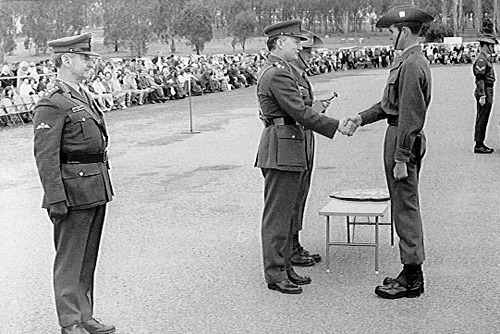 I was assigned to the RAAMC and after Corps training spent the rest of my National Service in the QM’s office at 2 Mil Hospital at Ingleburn. 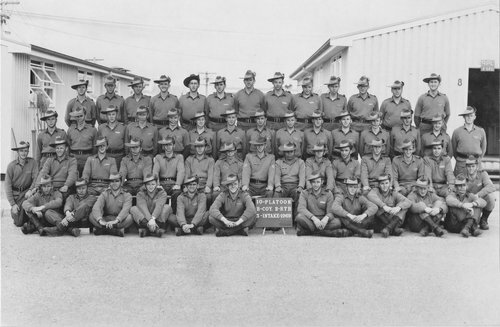 One of the few rewarding but often disconcerting tasks I had to perform, was to, once a fortnight, travel to Richmond Air Force Base to arrange for the transfer from the Hercules aircraft, the subsequent Customs-clearance, and finally, transportation back to 2 Mil of the less-seriously wounded Diggers medivac’d out of Vietnam. 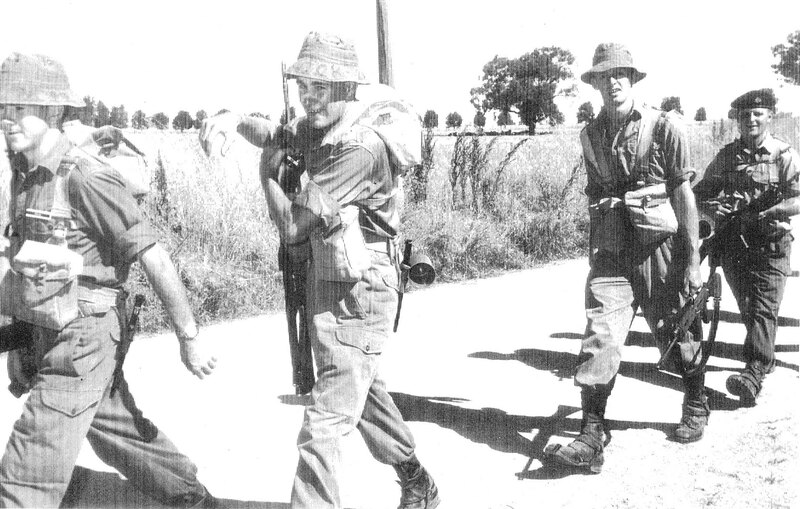 The more seriously wounded guys were sent straight to what was then the Concord Repatriation Hospital. 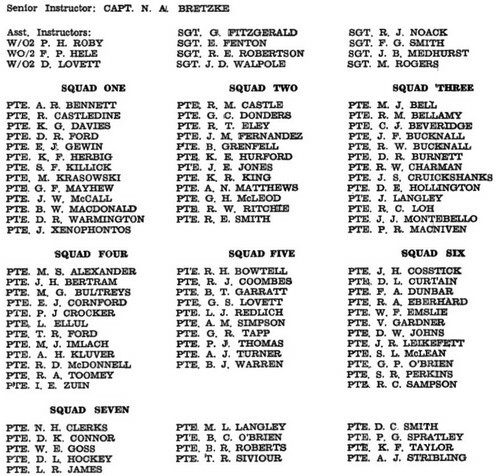 A few days before the Herc arrived, I would receive a manifest of those being medivac’d. 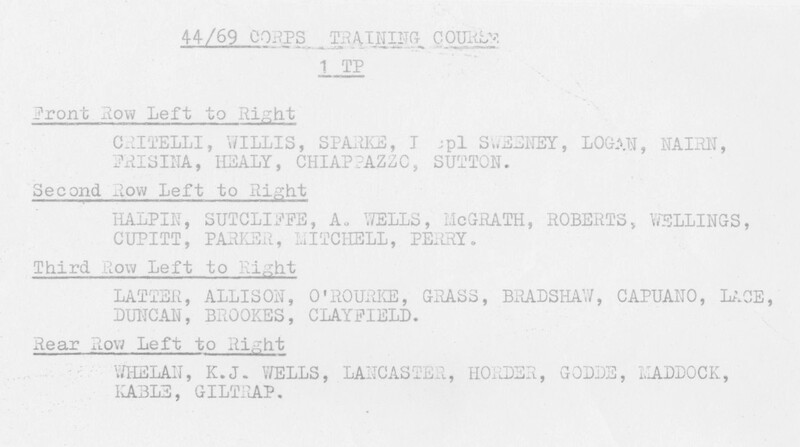 The manifest would show Regimental Number (thus revealing Nasho or Reg), rank, name and a brief description of the injuries sustained. 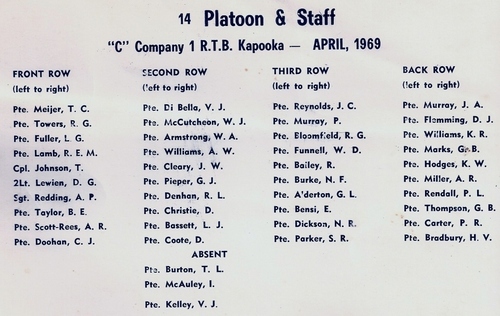 I might stand to be corrected, but my recollection was that the flight from Vietnam took some 30 hours, including refueling stopovers etc., and must have been quite an ordeal for those poor fellows wounded. 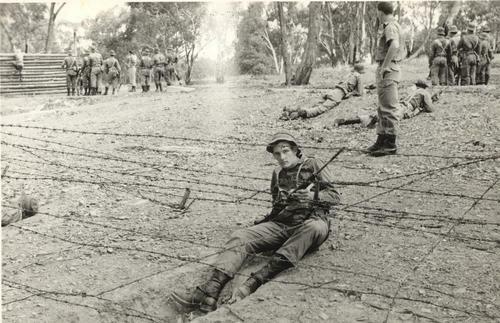 It was hardly first-class seating. Stretchers were effectively suspended along the sides of the fuselage with anything up to 30 medivacs at a time and no flight attendants serving meals. 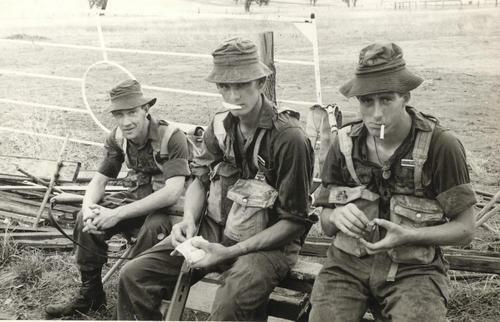 The poor buggers did it tough! Watching the guys being transferred from the Herc to the Army ambulance, it was not usual to see the blanket cover a single leg rather than two, or dressings over eyes, or bandaging that evidenced the absence of some (or all) fingers, etc., etc. Nevertheless, I got to know a quite few of the evacuees and other staff who spent time at 2 Mil and would welcome contact from any of them, in particular, Gary Parrott, who worked in the Linen Store alongside the RSM’s wife. 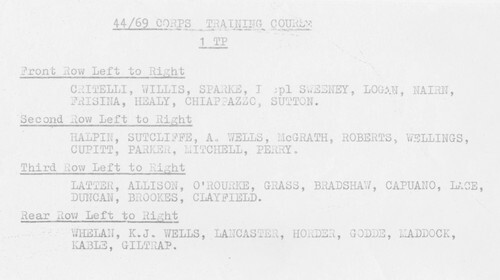 2nd Back: Goodenough, Guidera, Brown, Duffield, Ford, Allingame, Gallash, Curtin, Fletcher, Barry, Burner, Cameron, Hill, Ward, Herbert, Dolland, Drew, Aunger. 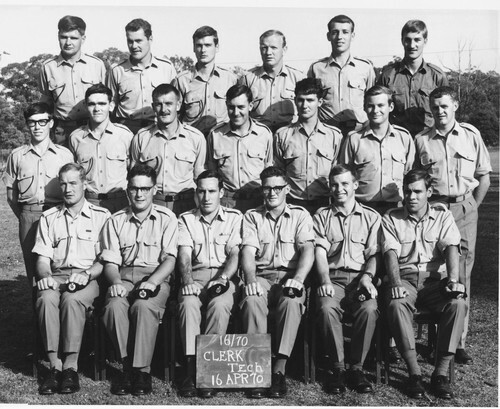 3rd Back: Caddle, Hughes, Hayton, Barnes, Agastino, Bertram, CPL Raine, BMD Murphy, SGT Grabowski, CPL Batson,CPL Ambrose, Bennett, Harten, Collins, Frydrych. 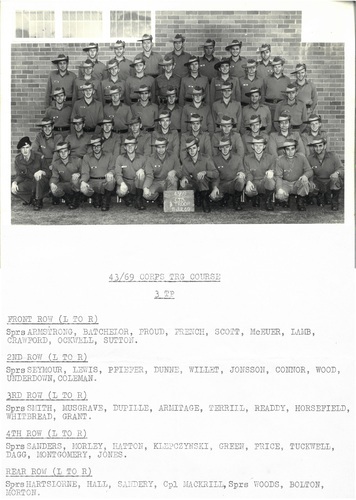 Front: Borg, Hand, Hurford, Beck, Fotheringham, Rothe, Johnson, Flynn, Nykke, Bartlett, Fedojuk, Caddle, Hamon, Healy, Bowles, Cambrell. Top Row: Richard Rackliff,Binnie,Matthews,O'Gorman,Walsh,Lawrie,Coles,Harper,Kernick,Caseldine,Robin Braendler,Rodney Scutter,Payne. 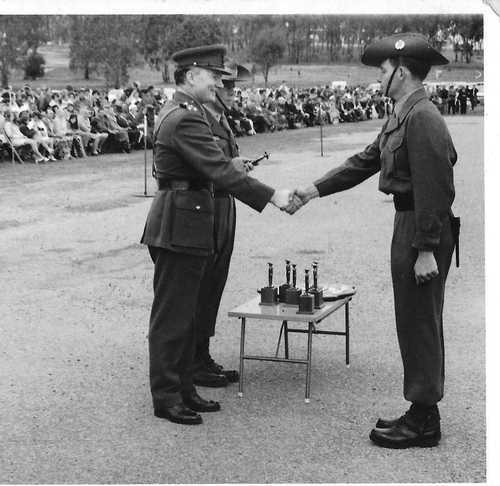 2 RTB D Coy 20Pl 2 Sect 1st Intake 1969 Pucka. 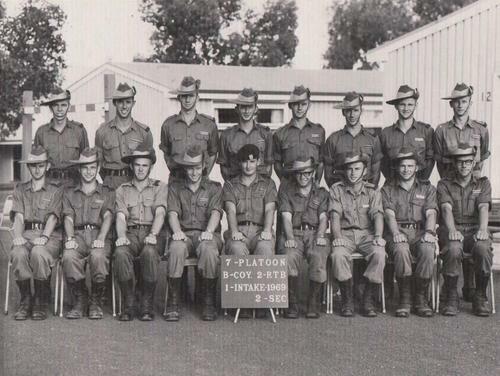 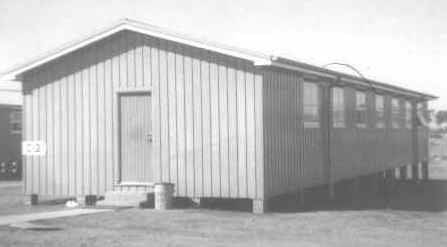 Hut 35, 2 Section, D Coy, 20 Platoon, 1st Pucka intake Jan 69. 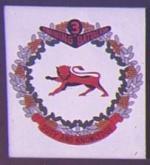 Barry Highett.M Osulliven.l Harding.Barry Hamilton . 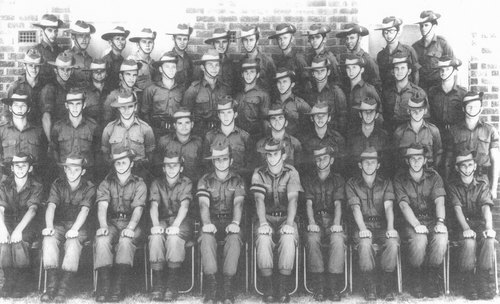 Back row . 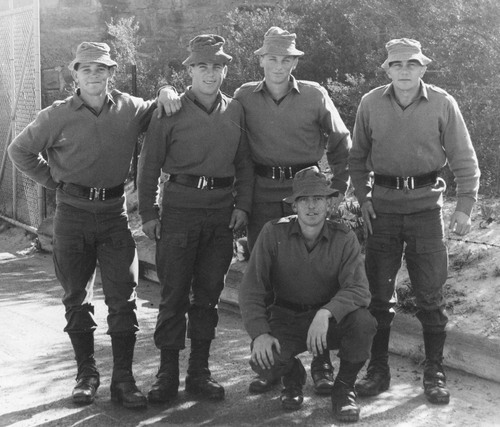 Sprs Mitchell; Ventriss; Wilson; Walsh; Gibson; Donohue; Eastlake. 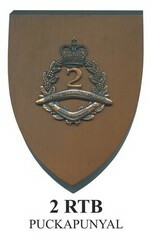 Mid. 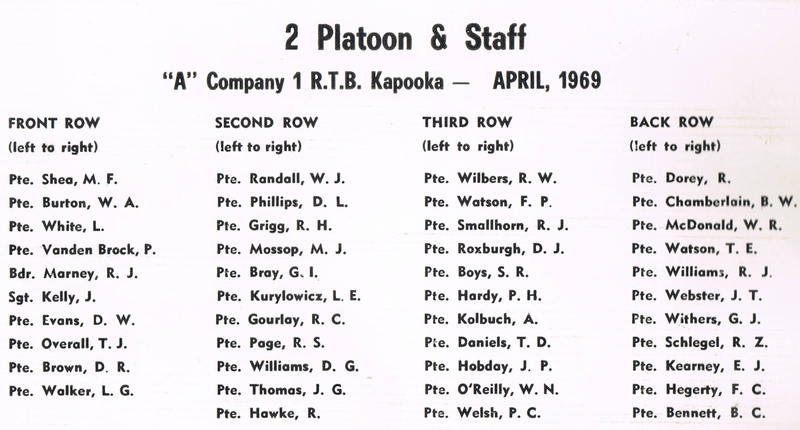 .row . 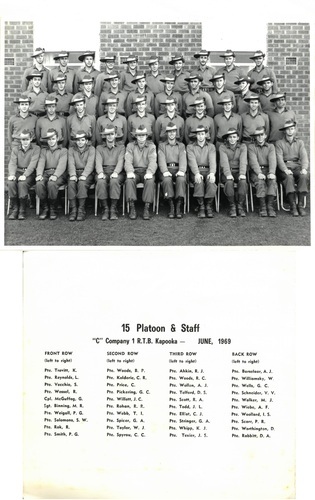 Sprs Blore; Martin; Cook; Lehmann; OKeeffe; Williams; Ventham; Chadwick.
. . . Sprs Fitspatrick; Augustus. Top R~1st Colin Gully.3rd Ted Middleton.8th Bill Harmer. Front row: 5th Mcneil . 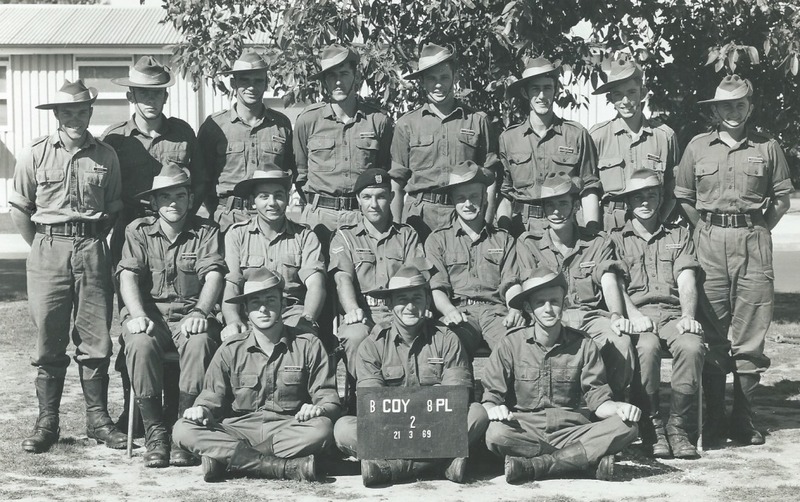 Back row: L-R 2nd Grant Helsinger.4th Ted Middleton.5th Colin Gully.